Organizations are often a way for like-minded individuals to get together and discuss the topics which interest them. They may also begin with loftier goals, and they may even work toward them to the benefit of others. Or these groups may end up as little more than social clubs for their members. Sometimes, these societies take on negative connotations, with nefarious plans to influence worldwide politics being a common accusation leveled against them. Other times, they’re just a way to engage in some fun-filled activities. Here are ten odd organizations of which you’ve probably never heard. Founded by four men at the Willard Hotel in Washington, DC, the Alfalfa Club derives its name from the plant. To be more specific, the name comes from the plant’s roots, since they “will allegedly do anything for a drink.” In addition, a possibly apocryphal story tells that it was created in 1913 to celebrate Robert E. Lee’s birthday. A society made up of only super-wealthy or super-influential people, it boasts around 200 members, with vacancies only opening up when a current member dies. New members must be invited. For the first 80 or so years, the Alfalfa Club refused to admit women into the ranks, a decision which was changed in 1994, after President Bill Clinton boycotted in protest. Though it has since disbanded, the Dill Pickle Club was formed in 1914 and was the brainchild of a man named Archibald “Jack” Jones. Jones was a Canadian organizer for the Industrial Workers of the World, a union dedicated to protecting workers. After leaving the group because of an argument over their tactics, he decided to start a society for people to discuss labor and societal issues. Some of the most famous figures in Chicago’s history were patrons, including Upton Sinclair and Clarence Darrow. Once Prohibition began, it also became a speakeasy, increasingly popular with younger people, especially those in college. Performance, whether artistic or musical, only added to the appeal of the Dill Pickle Club. However, by the early 1930s, Jones decided to no longer pay protection money to the mob, and the group was subsequently shut down by the police. A relatively obscure British organization, the UK Roundabout Appreciation Society (UKRAS) does exactly what it says on the tin: They are a society which appreciates roundabouts. Operating under the belief that nothing but straight roads leads to unsightly boredom, they propose installing roundabouts wherever possible, as well as using the land in the middle of the roundabout to place a piece of art, a monument, or even a windmill. In fact, a roundabout with a working windmill was named the best in Britain by UKRAS. Their only real public presence is the fact they seem to be incredibly generous, often giving away money in extravagant ways. During the commencement address in 1947, a small explosion took place near the stage, with a check for $177,777.77 floating to the ground. (The money was used to establish an interest-free loan fund for any student, faculty, or staff member who found themselves in financial trouble.) Other donations included $77.77 to install a drinking fountain in 1955 and $14,777.77 in 2008 to start a fund for student-submitted ideas for improving UVA. Officially known as the Ancient and Noble Order of the Gormogons, this particular secret society sprang up in 1724, when an article in London’s Daily Post described their appearance in the city. They claimed to have come from the Chinese, millennia in the past, and their goal seemed to be to set themselves up as anti-Freemasons. In fact, if a former Freemason wished to join the group, he had to first renounce the Masonic Order. Since they left no paperwork or writings of any kind, the origins and practices of the Gormogons are all but surely lost to history. One theory is that the group was the creation of Andrew Michael Ramsay, an ardent Freemason otherwise known as the Chevalier Ramsay. Whatever the truth, they disappeared in 1738, the very same year Pope Clement XII published his bull against Freemasonry. Finally! Our first secretive, pulling-the-levers-of-global-politics, conspiracy-laden group. Founded in 1973 by David Rockefeller, allegedly after his fellow members in the infamous Bilderberg Group refused to include Japanese members in the club, the Trilateral Commission was designed to foster cooperation between the leaders of Japan, Europe, Canada, and the United States. Rockefeller, as well as the other co-founders, saw problems with the status quo, believing the various countries that make up the Trilateral Commission would benefit from a focus on solving their common problems. Durham University, located in North East England, is home to a UNESCO World Heritage Site (Durham Castle) and, perhaps a bit less well-known, the Durham University Assassins’ Society (DUAS). Founded in 1996, DUAS is one of the oldest, as well as one of the most active, assassins’ societies in the world. They run a number of different “games” throughout the school year, ranging in duration from a few hours to a few weeks. 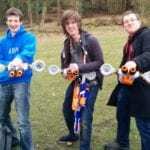 The “games” consist of players attempting to “kill” other players, normally with a Nerf gun or a cardboard knife. After making little to no headway, Bihari sought out others like him. He eventually found a large underground collection of people and decided to form the Uttar Pradesh Association of Dead People. Their main goal is to force the government to recognize they are alive, something which often goes hand in hand with reinstating land which was illegally taken from them by corrupt politicians and crooked family members. In addition to attracting thousands of fellow Indians to his group, Bihari also received the Ig Noble Peace Prize in 2003.